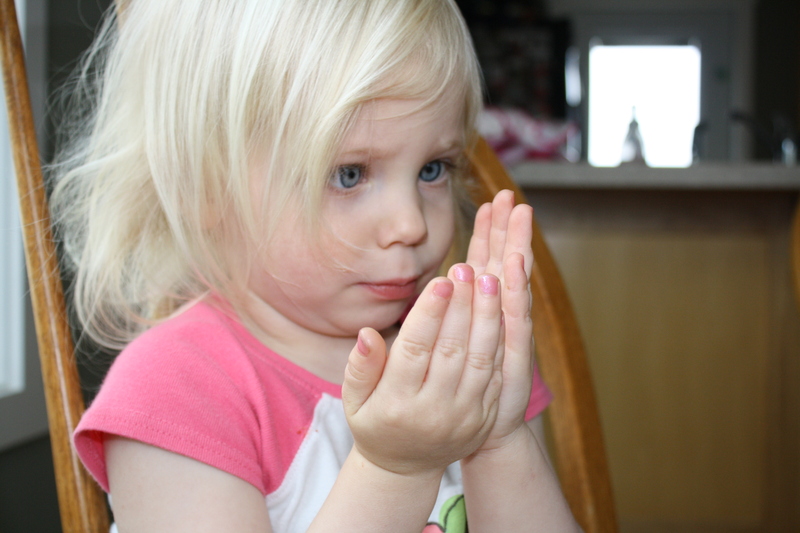 Better Together » Blog Archive » Mommy, color your fingernails? The little girl who can go from digging in the dirt to stomping on bugs can go to wanting her necklace and ring and eating on her princess plate inquired at the right time for mommy to paint not only her toenails but her fingernails too for the very first time. Both girls are squirmy, to impatient to sit THAT LONG so I never did it. Some moms are doing it at 3 months. Nahh… no need to move them along in life that fast. So I grabbed the box of nailpolish along with the bottle of removers for those curious fingers and brought it downstairs. I opened the box and Anna with an “oooohhhh” in a breathy excited tone. I told her she could pick out a color and of course she picks those weird colors I’ve had since highschool. Don’t want to talk about that. On the 3rd try she picked a pretty glittery girly pink. Perfect. She sat on the chair next to me and to took her tiny toes into my hands and began the “coloring.” She cooperated really well and then wanted to her fingers done too. I obliged and got through that without much hassle. Good thing for 10 year old Quick Dry from Mary Kay that still works! Izzy even let me do her toes too – well I say “let” she didn’t really want to and seemed like she thought it would hurt. But we got her pudgy little toes pretty in pink too, a little Quick Dry and off she went to wonder why mommy smuggled her and put this stuff on her toes. As the day went on, Anna was showing Aunt Sheila her “broken” fingers and “not broken” fingers aka the ones she picked off the polish and the ones she didn’t. She told me later that I had to “fix it, mommy”. Hehe. Those little girls are getting so big already…… ::sigh::…..